Tal Cual editorial today gives the numbers of public housing built by the last three administrations in Venezuela (1). The simplicity of the figures deserve an illustrative table. To the number of lodgings built in total and yearly, I have added the major problems faced by each administration, as well as any political advantage that they might have benefited during their tenure. The numbers are eloquent by themselves. Just as the 1999 Vargas disaster was followed by inefficiency and corruption, so is the public works program and, more essential, the public housing programs mired in at least inefficiency. Interestingly chavismo does not even pretend to deny these numbers and instead launches in a campaign to make believe that housing is sprouting everywhere. The latest show was actually Chavez in Yaracuy yesterday doing his "Alo Presidente" Sunday talk show. This picture from the Bolivarian News Agency shows Chavez and the new Yaracuy governor Gimenez supposedly inaugurating just made buildings in Cocorote where, we were told, some of the refugees of Vargas 2 will find solace. Well, it is all at least a semi lie. The pair of buildings have actually been built since the middle of last year, AND NOT even in the district, Independencia, of Gimenez, now the governor of Yaracuy. But that does not stop this one from taking all the credit and put hound-like the glory at the feet of his boss. How do I know that? Well, I drive in front of them occasionally. I was actually wondering if I could buy an apartment myself there but was told that all was "reserved". And after that how can I believe that the government will build 200 000 homes in the next couple of years? Added later. Miguel did translate this editorial. Jennifer McCoy, the LatAm point woman of the Carter Center, came to Venezuela again. The stated objective was to close the Carter Center offices that were opened sometime in 2002 when the country seemed on the verge of civil war. Was closing the office a sign that their mission had been accomplished? Or an admission of failure and a classical case of "declare victory and leave"? From the press not subjected to the claws of chavismo it is easy to conclude that the Carter Center has completely failed in its role of mediator and peace harbinger, no matter what Dr. McCoy bravely declared in her report and farewell press conference. Let's look first at the chronological development of the visit. The stay was announced for two days and in fact lasted three. The first day of Jennifer McCoy did have a couple of semi surprises, and certainly some interesting moments. She mentioned that although the political climate in the country has improved "there is a need for a basic consensus because there are divisions between the citizens of what should be a common vision of the country"
Now this has to be one of the biggest understatements of the Venezuelan political situation where we have gone from near civil war to an authoritarian regime. No wonder the political situation has improved, what can the opposition do besides offering its chests to the guns of the army? "We have talked of impartiality and of the importance of having guarantees for transparency, to have controls and audits of the process, as well as modernizing the electoral registry"
It is of course easy to point out that this exactly where the Carter Center failed miserably through June and July of 2004. But at least one must be thankful for the final admission from the Carter Center that the electoral system of Venezuela is a sham. Better late than never, one may say as a consolation. It is to be noted by the way that she did not accept any questions after reading her statements both at the CNE or at the National Assembly, her next stop. The only results there is that an hysterical chairman, the most ineffable and intellectually limited Nicolas Maduro, showed his class by asking McCoy to go to the US and defend Chavez's life. Of course, Dr. McCoy, a well behaved person showed sympathy and seems to have assuaged some of Maduro's anguish at losing his job if his boss is shot to death by a CIA operation. Still, as was revealed on Saturday, Dr. McCoy seems to have asked the National Assembly to put some order in Venezuela by electing once and for all a really independent CNE and remove the repressive laws on freedom of expression that are being enacted and that have hit Tulio Alvarez and others already. At any rate she was fast set right there as to any wishful thinking she might have had at the CNE about an improved political climate. The most visible leader of what is left from the opposition, Julio Borges of Primero Justicia (PJ) complained about the visit of McCoy. Maduro simply told Borges to go somewhere else with his show and that he was an "ultra rightist and fascist". Did Dr. McCoy wonder who was the real fascist there? Possibly to the great disgust of ridiculous Maduro, Dr. McCoy had the courage to meet with Julio Borges. Until then it seemed that no one in the opposition was going to meet with her. Well, she would have probably being better off if no one had met with her. "We made it clear that many, if not a majority of Venezuelans, as a matter of fact see that the Carter Center has lost the trust and the possibility of being a mediator, to facilitate and be a bridge in the country, because they had an attitude of hurrying up business and wash their hands of it"
"We told her that if they came to Venezuela it was to call things by their name, what has been done inside the CNE and that they must understand that this country after the referendum was left more divided, has lost faith in elections when people wanted to have more faith in the vote, that they feel the institutions are held hostage, that there is a desire to pass laws that are not good for the country, but politically to dominate institutions, [...] that our umpire belongs totally to Chavismo and that the Carter Center has a share of the blame"
Borges claims that McCoy seems to have understood. Actually that meeting did not take place but Milagros Socorro Op Ed in El Nacional of Thursday certainly did not garner her an invitation. That probably could explain why the agenda of Dr, McCoy on Friday was not reported the way the one on Thursday was. But what did that editorial say? The piece is titled "Jennifer comes back to the grey zone". In it Milagros Socorro explains how she took the time to read a lengthy assay of McCoy (with David J. Myers) published under the UCV editorial [Politeia] in Venezuela and where apparently it is quite clear that Dr. McCoy is a fine connoisseur of Venezuelan contemporary history. That article covers 1972 to 2002 and seems to indicate that McCoy (and the Carter Center, and Carter himself presumably) should have known in May 2003 where were things headed. Thus, the hard question: why did they accept to follow the rules imposed by the government and then the CNE as of that date, rules that eventually made it impossible for any serious observation to take place, making the European Union desist on monitoring the referendum? Why did they encourage the opposition to go ahead with those rule is added by this writer? The implication of this Milagros Socorro article are quite clear: McCoy and Carter Center have a lot of explaining to do if they want some day to recover some moral and intellectual credibility. Saturday Dr. McCoy made a press conference and left the country. It does not seem from what I can gather that she is ready to come back anytime soon. I must admit that her visit went actually better than what I expected: she made enough concessions to at least hint that she might have made some mistakes. Not enough, but a start. Any positive spin would have been uphill as the Carter Center was even warned that trying to refloat the opposition to give Chavez more legitimacy would be a tactic easy to see through and would not help its standing, not to mention that as far as this blogger knows McCoy only met with Borges and that was not too good. She also seems to have met with some NGO with no better results, at least from the opposition side (1). But still, McCoy managed not to look pitiful. Perhaps her big point was to state clearly that she did not think that the US is trying to kill Chavez, and that at any rate this one should take that matter directly to the US instead of doing a media show. She might be a US liberal but McCoy knows that the US has changed positively in this respect since her boss was president, credit where credit is due. On other points she made public her recommendations made to the National Assembly president who must feel right now quite inconsequential (but I trust he is used to it with his own boss). In short: a real independent CNE, guarantees for the freedom of speech, adaptation of Venezuelan laws to the international criteria to what constitutes slander, and even to consult with International Human Rights organizations when elaborating legislation. But a little too late, I am afraid. In an informal survey made by Globovision Friday 97% of respondents were critical of the Carter Center. Even by Globovision pro opposition standards, this number was very high. The extended, and untimely visit hints to the Carter Center (and Jennifer McCoy) having obviously more problems than what they care to admit. The Carter Center refuses to take any blame though it hints at things that could have been done differently. Too little, too late. Thus, as expected, they came to declare victory and leave. They gave us, the natives, a list of things to do as they wash their hands of the mess to which they greatly contributed. On this aspect the Carter Center shows itself to be as clumsy about Venezuela as the Bush administration approach to Venezuela in its first term. At least this last one has recognized in recent hearings that it did not deal well with Venezuela. The Carter Center, and Dr. McCoy, will need to do a lot more to recover their credibility and to demonstrate that they do have the intellectual mettle for this type of political conflict that the Chavez example is certain to seed further in Latin America. Their responsibility is heavy. And of course, appeasement only postpones tragedy. The award for Post of the Month goes without a doubt to Miguel who had the observing talent to see that "The Revolution will be photoshopped". The contest was hard as this blog had its second highest month since keeping tabs with a series of hard hitting posts. But this blogger knows when he is licked and bows to his good friend Miguel. Good going Miguel! Bloggers suffer from certain criticism that are inherent to their condition as free agents. In the comment sections there are often accusations that the given blogger does not offer the data(as if a blogger had access to data the way a journalist does, please! ), that his/her English is deficient (quite an effort for those bloggers that must write in English to make the plight of their country known, and there are a lot of countries who must rely more and more on bloggers for the outside world to take notice) and a few more charges. This particular blogger has never let these charges get to him for a very simple reason: he trusts the intelligence of his readers to understand the limitations of the media and to detect that his efforts are as serious as possible in his situation. However as it so happens, there are exquisite moments when one feels vindicated. From Venezuela writes Vladimir Chelminski in the Wall Street Journal. To make it there it is assumed that the article has been edited at least for the English quality and the basic veracity of the data presented. The WSJ is a serious journal and an article such as the one of Mr. Chelminski is not an opinion piece: it is a summary of recent Venezuelan history and thus a reference subjected to scrutiny by the editorial board of the WSJ. Well, regular readers of this blog will surely recall that every single point that is addressed in this excellent report has been discussed in these pages, and the pages of Miguel's blog for that matter (or many other blogs in Spanish). It warms the heart of this blogger who surely hopes that such a respectable article will get a better treatment than this blogger words. After all, IT IS the WSJ! CARACAS -- After six tumultuous years in power, the claim by Venezuelan President Hugo Chavez that he is leading Venezuelans toward greater prosperity cannot be sustained. Any serious analysis of our economy shows a dramatic deterioration in Venezuelan well-being. A series of feel-good government programs only help ameliorate the negatives that would otherwise accrue to Chavez with his disastrous handling of the economy. In 1998, the vast majority of Venezuelans were very poor and had no good reason to hope for a better future. For decades, the quality of life had been deteriorating. The democratic process seemed to function well only for the benefit of politicians and their friends. The political parties that had alternated in power since 1958, Social Democrats and Social Christians, were very much the same. Both offered socialism with political freedom. Their policies paid lip service to the poor but always proved counterproductive. Private property and contracts meant little in their laws. Two-thirds of willing workers could not find employment in the formal economy and The Heritage/Wall Street Journal Index of Economic Freedom classified Venezuela as "mostly repressed." The country needed dramatic change. In that same year, presidential candidate Lieutenant Colonel Hugo Chavez swept the country's imagination with a good assessment of our problems, but wrongly naming economic liberalism as the cause of the misery. He promised a new state with new laws and sold hope to the poor. In December 1998 he won the presidency and for some time after his inauguration, he continued to gain popularity. It is true that Mr. Chavez has expanded pension payments and implemented programs that did not exist before, like the 11 "missions" programs. Three of these programs are educational. "Misión Robinson" is designed to teach people to read. Participants receive a monthly stipend of 160,000 Bolivars (about $83) and in six months they may receive a sixth-grade diploma and can graduate to "Misión Ribas" where they have the same stipend and in six months may earn a high school diploma. In other words, an adult with no previous schooling can earn in just one year what normally takes 11 years. Another "mission" program provides Cuban doctors, to live and work full-time inside poor communities, ready to help with minor health problems at any time, free of any cost to patients. But as in education, the quality of this care is an unknown. If a medical doctor with a Harvard degree arrives in Venezuela , he cannot work until he revalidates it. But a Cuban doctor's credentials are taken for granted. Moreover, no one knows the cost of these doctors to the nation since they seem to be provided in exchange for Venezuelan oil to Cuba. Yet another "mission" sells food staples at significant discounts from regulated prices. This is destroying the private sector at the retail, wholesale and industrial level. The financial transaction tax of .5% is particularly damaging. Because most of the population is poor and does not use checks, the government says the tax won't affect them. This ignores the fact that business passes its cost onto consumers. In addition, there are consumer taxes which I estimate create a 22% mark-up on staples. Tax rules now stipulate that even the purchase of a cup of coffee requires the consumer to tell the vendor his tax identification number and address. A main characteristic of our repressed economy is the imposition of exchange and price controls two years ago. We've seen this movie before. Venezuela had these controls from 1983 to 1989 and from 1994 to 1996. In both cases, corruption ballooned, and the economy sank. In the end, they had to be discarded amid scarcities and hyperinflation. Another economically pernicious measure introduced by this government is property confiscation. Earlier this year, the country's most productive ranch, owned by the British company Vestay Group LTD since 1903, became the target of a potential confiscation with plans to partition it for "cooperatives." This may be popular with the poor but if the past is any guide, the newcomers will either starve or go back to where they came from. Meantime, the nation will have lost a major productive asset. Next we'll be wondering why there is not enough investment and job creation. Mr. Chavez still has credibility among his disciples and his charisma may carry him for some time to come, despite rising crime, filthier cities, declining services, an expanding informal economy and more beggars in the street than ever before. His followers are so infatuated that they do not pay attention to the contradictions in his speech or his numerous promises never fulfilled. But when the price of oil comes down, the "missions" will be unsustainable and the bloom is sure to fall off the rose. In French "Fait Divers" is an expression not too easy to translate if one wants to keep its Gallic flavor. It is used when, for example, newspapers report strange events that have no relevance to the greater design such as a love triangle murder or a specific museum robbery. Not quite "miscellaneous" but somewhere along the line. This is the best way to qualify the recent faux pas of French diplomacy, "diplomacy" used in a charitable way when France's foreign policy is concerned. The item is that the French ambassador in Caracas, Pierre-Jean Vandoorne, did meet with Rodrigo Granda sometime in April 2004. This Granda is of course the "foreign minister" of the FARC who was arrested last December in Caracas, whisked to Cucuta, and became the cause of the latest diplomatic rift between Bogotá and Caracas. It is also the same Granda that walked around Venezuela as if nothing, who became a Venezuelan citizen "very easily" and just on time to vote on August 15 (for Chavez it is presumed). It is also the Granda that has just being implicated in the kidnapping and murder of the daughter of a Paraguayan ex-president. A very nice fellow this Granda, to the point that Colombia is already willing to send him to Paraguay to stand trial. So why would Monsieur Vandoorne meet with Granda? In Venezuelan territory nevertheless! Well, it is a long story of Gallic hubris. It turns out that a political rising star of Colombia, Ingrid Betancourt, former presidential candidate, with a nice sounding French name, happened to have resided in France in exile, married a French man, wrote in French, and was thus the toast of Paris salons who suffer from quite an inferiority complex in front of the advances of English in the Wide Wild World. I cannot say much about Mrs. Betancourt but I suspect that she was smart enough to use the French. Unfortunately for her she got kidnapped during her electoral campaign, a terrible and unfair situation that she is still enduring after three years. I feel for the French ambassador. 2004 did not end very well for him as Mr. Muselier, the French foreign secretary made some rather unsuitable declarations backing the authoritarian state that is slowly but surely being installed in Venezuela. But we all know that French diplomacy will balk at nothing to peddle French goods. And boy, are they trying to sell stuff to Chavez!!! After all, Chavez is kicking out the US and surely France should step in less than China, or anyone else, takes too much of a bite. And now this! How could Monsieur Vandoorne negotiate with Granda in Caracas? At the French embassy no less!!!!!!!!! Aren't there discrete restaurants where they could have met? And without even the agreement of the Colombian government!?!?! Though Betancourt's husband states that Uribe blocked the negotiations. So? Is this the Granda 2 affair? Will Chavez blame Uribe for knowing that Granda was in Caracas having tea at the embassy? I think that Chavez, and now the French, have a lot more to explain on Granda. More than a fait divers? And the French should also explain how come their foreign policy is so sloppy, so mercenary, plagued with so many free agents (the husband of Ingrid is not the first Frenchman doing "independent" negotiations that could dangerously implicate the French government in business where it would be well advised to keep its distances, as it happened recently in an Iraq hostage negotiation). PS: added two days later. It seems that the Colombian government did know something of the negotiations. Of course, like in all such cases who knew and what will reamin murky for ever and ever. But conveniently for France, and Parisian newspapers, a new scandal that forced the resignation of the finance minister comes right on time. After all, this is a Parisian affair, and Ingrid's fate will again depend on the salons activities of Paris. Quite a headline isn't it? Legend: If you are going to repeat a tale, do not pick the one of the darned presidential assassination (much better in Spanish of course). But that such a supposedly serious matter is taken like a cartoon (and Rayma is not the only one) tells you volumes about the mood of the country. "Therefore, we have to take note of intelligence data pointing out that attempts are being made to liquidate our President, who has been legitimated by the Venezuelan people every time he has faced an election," Rodríguez added. I suppose that this is the very same "intelligence" that has not finished to reveal the Danilo Anderson case or the very same "intelligence" that had Granda and others vote in Venezuelan elections. But in a spirit of cooperation I am posting this little table I made that could give an idea on the reasons why Chavez feels there are people after him, GWB notwithstanding. I think that the intelligent readers of this blog will know how to figure out where the smoke screens really are. Bwahahahah!!! Gasp! Bwahahahahahahah! (tears of laughter, blogger convulsing on the floor subject to one of the biggest laugh attacks recorded in blogdom). Today we learn that Jennifer Mc Coy of the Carter Center will brave Venezuela to offer help in consolidating peace and democracy! What is in store for us? Are they going to approve the new judicial system whose near uniform composition will ensure "peace" through a "uniform justice" (pun intended)? Will they offer to monitor the 2006 elections to validate yet another "fair" Chavez victory? Will they congratulate Jorge Rodriguez from becoming the new president of the C-osa N-ostra E-lectoral? I wonder even how Francisco Díez dared to give an interview on the subject!? I have a piece of advice for any serious opposition leader: do not meet with them. Let them hang out with chavismo, DO NOT GIVE THEM ANY CAUTION. I can assure you that the opposition electorate will not forgive those who try to make new deals with the Carter Center. Actually, I would suggest that a good way to start the recovery of a prostrate opposition would be to organize a rally to protest the visit of Jennifer McCoy and whoever else is accompanying her. But seriously dear Carter Center: what can you possibly expect? Have you not learned your lesson already? Don't you know that Chavez will be nice and accommodating just to do as he pleases as soon as you turn your back to him? Who are you trying to fool now? Certainly not the opposition who, I hope, has learned who you are. Really, that is a lot of chutzpah for you guys to come back to Venezuela. Can't you leave good enough alone? What are your real aims? What are you going to offer Chavez now? Are you looking for funds for a new wing for the Carter Center? Please, please, leave us alone! You have no credit here!!!!!! Even if you were to try to do something to preserve democracy, what can you achieve at this point, having become El Tonto Util of Chavez and having lost any trust from the opposition? Please, get a grip! We all know, from both sides, that you are not here for us, that you are only trying to recover your image overseas. But I doubt it will work: the US press is on to you. PS: this is written from someone that used to defend you from opposition attacks. I was wrong, they were right. PS2 (added much later: Miguel has a nice run down of some of the failures of the Carter center mission. Do not miss it! Iranian Bloggers in jail. Soon in a country near you? OK, so this is a repeat title from a post last year. But since the folks at "Comittee to protect Bloggers" have made a day for two Iranian bloggewrs in jail, the least that I can do is to put a plug for them. Youy can learn the details and take action by visiting this site. And for those that would poooh poooh this, let me remind them that Chavez is pal with the Mullahs and that the Hebraica was raided while Chavez was in Teheran (!¡*?¿$&). It is very hard not to be paranoid in Venezuela this days when the government does its best to scare the media, even the US media. We are slowly emerging from the disaster in Venezuela. We got a start in Vargas and due to our 1999 psychosis we thought the end of the world was coming again, but it came to the Andes and Southern Zulia. Scores of killed and missing, whole villages flooded, when not torn away by the torrents with levels of water not recorded in recent memory. The heavy rains have ceased, though it still rained/drizzled all day in San Felipe today, and in Vargas it rains frequently in the afternoon. But anyone with clear thinking knows that it will happen again sooner than later. The Andes disaster reports are quite clear: deforestation, planting of crops close to river beds, followed of course by the shacks, that became small houses of the laborers lured by a false sense of security since for many years the river did not flood. No public officials to come and to tell them to move away, before or since Chavez for that matter. This prevention activity does not get you votes, and with the most populist government of our history I suspect that it will not get better no matter how many disasters we will go through. My brother went last Friday to get the car he had to abandon when he was evacuated in Vargas. He sent me this picture he took while driving back to Caracas. As it can be seen, the mountain pretty much slid down to the road. There is no more road to be seen, only a mud trail through which only all terrain vehicles can circulate. However a closer examination of the picture makes one detect that the truck ahead is carrying a BMW, a status car in Venezuela as you really need to be making lots of money to afford to import a BMW. Rich people, even in time of disaster can manage to retrieve their property, glorious bolivarian revolution notwithstanding. This picture became quite telling for me. Even more when you add what has become now a pattern with Chavismo, natural catastrophes are taken advantage of. In 1999 as Jorge pointed out, while pretending to rescue folks in Vargas 1, Chavez was busy grabbing the judicial power. During Vargas 2, (and Andes 1?) the government is trying to expropriate more land and to put an end to University autonomous statute (details in a future post). The link between all of it, you may ask? Well, it is Charles de Secondat, Baron de Montesquieu. But let's go by parts. Montesquieu came to fame when he wrote L'Esprit des Lois, The Spirit of Laws. With this essay he was the first one to articulate on a practical way the concepts of separation of powers, one idea that would contribute greatly to the political movements of the XVIII century that would eventually produce the American and French Revolutions, real revolutions those. It was from the British tradition that Montesquieu was trying to apply to France that we get concepts such as an independent judiciary, and a separate executive and legislative, concepts which are now totally missing in Venezuela, and whose lack certainly explain the lack of accountability that is in my eyes the main cause of the present administrative debacle, corruption and all. But back to the car picture. That picture is possible simply because the Chavez administration has been unable to decide what to do with Vargas after 1999. It could not decide to leave it as the pre 1999 mess it was, it could not bring itself to make it an elitist resort area and cash big on tourism taxes, it could not create a new plan, but it could not resist the temptation to pour money in it so as to benefit a few cronies of the regime. The rich anyway went ahead, rebuilt a few resorts on their own, got evacuated again 2 weeks ago, and managed to retrieve their cars back. Showing how useless the governmental action IS FOR ALL (if the sight of a BMW upsets your stomach, look at the photo galleries I linked earlier to see poor people in the mud, all classes suffer the contempt of the regime). But there also the Chavez regime is just a new avatar of the past. Unable to understand wealth (though quite able to enjoy it, even if illegally acquired), Venezuelan politicians have always been unable to come to grips with tourism, an activity that even Fidel in Varadero has understood to the point of letting his Jineteras have a run at US dollars. From its very nature Vargas is not a very viable state in classical economical terms, a narrow strip of land clinging precariously between the deep sea and the high mountains, it can only get some limited urban development, but no lush fields or powerful industrial complexes. Half of Vargas should be allocated to luxury resorts whose taxes would finance the other half for day time beach goers from Caracas. The only people that could afford to live there would be simply the workers of the port, airport and resorts who should get subsidies enough to be able to afford what would unmistakably become an expensive real estate (generating still more taxes by the way). After all this is what happens in Rio except that there is more room there and the favellas manage to cling next to the high rises of Ipanema. The favellas already exist in Vargas, what is needed is to rescue the sea front. And thus comes again Montesquieu in his other famous opus, Persian Letters, an imaginative way to criticize French society as it entered the XVIII century. Letter 107 is still the best case of why a society needs luxuries, and by extension tourist resorts, the luxury of our times. The creativity of a government should be directed, among others, in allowing folks with disposable income to enjoy it while generating jobs for the less fortunate and revenue for the government. On this measure the lack of creativity of the Chavez regime is for all to see. Chavez mezcla una gran inteligencia con mucha incultura (Chavez mixes a great intelligence with a considerable lack of culture). I wonder if Chavez ever read Montesquieu, and if he would able to understand the slight irony of the Persian Letters. Finally I am getting around to do some serious updating. The link section has changed a lot. Since I am not done yet it is a good time to let me know blogs or sites that would be appropriate for me to add (do not forget that Venezuela Today has it all, I want to add only sites that go with what this blog aims to present). Also I finally got around to have a feed system to work. I know, I know, I am HTLM illiterate (maybe there is a mision for that?). But the fact is that I do not use site feeds, and basically had no idea what they were for. Now the atom feed is working (or so I was told) and I will try to add another one over the week end. Other suggestions are welcome (other than erasing this blog, of course). Hola, it's A.M. Mora y León, signing off on Daniel's Venezuela News and Views. It's been a pleasure to "guest-blog," or "ghost-blog" as Daniel likes to put it, over the past couple weeks. Jorge Arena could not have been a finer complement with his thoughtful essays as well as a pleasure to work with behind the scenes, too. I thank you all - Bruni, Jose Roman, Barqui, Guillermo, Christina, Stig, John, Thomas, Roger, Quico, Feathers, Sydney, Ginger and many others - for your intelligent, informed comments from different perspectives that together added so much to the ultimately collaborative enterprise of blogging. What's that about Cuban doctors again? A Castroite state-controlled media organ reports that El Barbudo is incensed about Cuba not having enough doctors in Cuba in this news item here. Oh really? It's enough to make me wonder if he's almost as oblivious to economics as El Supremo. Of course there aren't enough Cuban doctors, Castro! You sent them off to be spies in Venezuela! Cubans have noticed this. And so have Venezuelans! Daniel researched that Misión Barrio Adentro program and found quite a bit of evidence of such shenanigans here. You've got plenty of Cuban doctors, Castro. It's just that when you send them to another country, you don't have them there to exploit in Cuba. The problem with this Misión Barrio Adentro Cuban doctor program is you've turned them into human chattel to be sent like a cash crop export to Venezuela to "pay" for all that "free" oil you get from Chavez. They're commodity chits, your very own Oil-for-Doctors program oozing in corruption for the 'love' of the barrio children and since these Cuban doctors now are effectively bushels of corn, you shouldn't be surprised there are shortages when you put artificially low prices on them. Corn after all goes for $2.20 a bushel while Havana doctors on the Castro Exchange trade at 50 cents a day. Not only that, as Miguel points out, real trained doctors from Venezuela are knocked out of the market because of these cheap Cuban 'freebies'. In the more economically serious parts of the world, this is called "dumping." But never mind that. Why is it that Cuban doctors are paid less than cab drivers and hookers in Havana? Doctors in Havana make fifteen dollars a month. Nurses there make eight bucks a month. This shows how much Fidel values doctors and nurses, paying them accordingly. Chavez, by contrast, pays them a princely sum, with this article here showing that Cuban doctors on Misión Barrio Adentro duty making about $200 a month for a three-hour, three-day work week. You get what you pay for. And when you have a busy spying schedule, three hours a day to be a medical commodity export will have to do. Speaking of lowball prices, does it ever occur to you, Barbudo, that you lose a lot of Cuban doctors to immigration? Some 500 Cuban doctors even in Caracas have decided that even the $200 a month doesn't cut it and have made their way to El Norte, Costa Rica, or any other country that will take them? People pretty well price themselves for what they are worth to put themselves to their best use. Economics 101. But among doctors, there are many for whom money is not the biggest consideration. The problem is something far more damning: the inhuman system you've got there, Barbudo, one no humanitarianly instincted doctor would want to get near. Recently, I researched the life of Dr. Hilda Molina, an elite surgeon in Havana who trashed her party card ten years ago and tried to pay a visit to her grandchildren in Buenos Aires, something you wouldn't allow, because she was Cuba's 'intellectual property.' (That old commodity thing again, no?) She didn't want to be a doctor in your communist paradise because she objected to the inhuman two-tier system of medical care - one for rich Sandalistas, and the other for ordinary Cubanos. You can guess who gets the better end of the deal based on whose money was good enough and how any decent doctor would feel about it. But life is funny. There's something about those yanquis and their dollars that always puts them on top of things, even in the heart of your impoverished communist paradise hellhole that doesn't follow the rules of immoral global capitalism. Somehow the yanks and euros end up on top over there too. Try basic economics, you schmuck. Barbudo, perhaps if you paid Cuban doctors, let them use their minds, stopped forcing them into spying, dumped the offensive two-tier health care system and quit treating them like chattel for El Supremo's political purposes, you might actually have a few doctors in Havana. But this isn't about providing health care to Cubans. This is about your own ego and your own effort to propagandize about your regime's supposed focus on health care. Which by all economic and humanitarian measures is one of the world's most dismal failures. Carlos Alberto Montaner, who first impressed me with his Guide to the Perfect Latin American Idiot, has got a stunning new essay out on his Firmas Press site, one that I found shocking with its clarity of thinking and dangerous implications. It is well worth reading. How help for the victims of the Vargas 2 disaster and the floods in the Andes is distributed as long as it favors the political interests of Chavez and his minions. Tal Cual makes a very serious accusation in its editorial today, an accusation that anyone who watches the current TV reports on the disasters that are besotting our country can make: the government, be it at the national level or at the local level, is trying to politically benefit from the relief effort. Immorally should I say, but let me translate part of the editorial. The full one in Spanish can be read here. forbids in places distribution of relief help by whomever is not dressed with a red shirt or an equally colored beret, we are in front of charity with claws. When the state TV,VTV, broadcasts several times a day an add where victims thank "President Chavez" for the received help, we are in front of charity with claws. The incidents keep accumulating in our newspaper editing office. In a gloriously infamous revolution, so rich in such moments were morality, decency and plain human rights are simply ignored or attacked out of sheer pleasure from the authorities, or so it seems at times, these new incidents will occupy a rather prominent place. There is that myth that only the political left love people. Again, reality tells us otherwise. We can see that sycophants never love people. And their inspiration probably not much either. I am writing a long postponed note to thank my ghost bloggers. I think that they did a great job, pleasing a lot of people and making a few miss me. Which is exactly the point of having ghost bloggers. A blog is a personal page, where as a writer I am only limited by my conscience and my education in polite and civil behavior. But these being subjective values, what can be polite for me can be grossly offensive for others, or just plain wimpy. Ghost bloggers of course allow for people to compare and I am surprised at how well it worked, how many people were induced in expressing themselves on the subject from begging me to retain the ghosts to give it up (which seems to have been the real objective in those cases, not me, to close the blog altogether). There is a lesson to be taken. A multi hand blog can be indeed a good thing, revitalizing an old formula. The trick is to find a way to still maintain the overall flavor of the original blog while letting new airs flow. Not easy, unfortunately. As of today I am recovering full use of my blog. That is, I will cut today access to Mora and Jorge. A symbolic thing since they have stopped writing. And I will think about changes, many changes actually. But all in due time. Mora, to my political right, was a clear example that the opposition voices can be quite more radical than me, or Mora for that matter! In fact, we are both placed in the same camp because we are both democrats and we equally dislike extremes. Putting Mora was to remind folks that oppose me that I am much more liberal than they thought I was. Yet, I have a fine relationship with Mora, simply because we share the same basic social values of tolerance, respect and democracy and we see in chavismo the same authoritarian evil. In a normal world we would be opponents, but in today's world there is much more that unite us than separate us and we are lucky to appreciate this and become friends. Freedom accepts no compromises. Jorge was put there because we come from a similar scientific formation. But that I wanted to keep a scientist in was not the only reason to put Jorge in for a few weeks. For that I would have put Miguel if he did not have a blog of his own. I thought that Jorge has the ability to write a blog but does not have the time and this ghosting experience would be a nice way to try out. I think that the results speak for themselves. I will, if Jorge requests it, re extend on occasion access to my blog. Not that I do not want to do so with Mora. But Mora has already quite an exposure elsewhere and does not need this modest blog when Mora can write in blogs with much larger audiences. However I will be honored if Mora wants to ghost blog again in the future as I might travel lengthily later in the year. After all Mora seems in the way to become an Internet star of ghost blogging!!!! Finally a note. Someone of course wondered whether I could not find a pro Chavez person to also enter. I must confess that I would love to find a rational pro Chavez to ghost blog once. That would have been possible as late as 2002. But I think that it is not possible anymore. 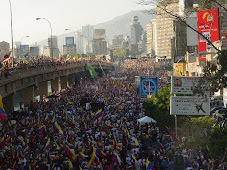 Since late 2002 it seems it has become difficult to establish a dialogue with the chavista camp. There might be many explanations but mine is very simple: this blog is about independence of criteria and chavismo has become all about submitting your free will to a leader or cause, as in "no questions asked". This is simply intellectually repulsive for me, not to mention offensive as it tries to pretend that I am submitting myself to other "forces". I do not mean to offend anyone with this and I would love to be proven wrong. I just write this as a statement of fact. Again, my greatest thanks to Jorge and Mora for taking so much time to work on this blog. You have made it better. With the suggestive title of "An announced disaster", Tal Cual's Ilich Otero has come up with his own photo gallery of the Vargas disaster. From the cover pictures it will become quite clear, if there were any doubt still, that the victims of the governmental neglicence are as usual the poorer sectors of the population. So much for a government who pretends to care for the poor. To Jesse "James" Chacon, Venezuela Interior (Homeland US equivalent) minister. In some declarations published in El Nacional Monday, he simply states that the delays in the works for Vargas were due to the April "coup" and the general strike. Let's look at numbers a little bit closer and expose this liar. Rescue efforts and basic communication with the shore reestablished by January 15 2000. "First" useful recovery period of Vargas: From January 15 2000 until February 2002 when the currency is devaluated. Then we would give a couple of month for the government to readjust the budget EVEN THOUGH the monies for Vargas were already allocated. That gives TWO FULL years of work. Allow me to remind the reader that for example Chavez had "promised" to build 5 000 subsidized housing in TWO YEARS. No more than 500 of these seem to have been built to date. "First" suspension of works for Vargas: From February 2002 to June 1 2002. OK, so April was not a good time to restart the works of Vargas, even though the government HAD THE FULL MONTH OF MARCH 2002 to re-budget everything and give the order to restart the works even if more limited in scope. But by May 1 2002 the administration was functioning again, the country was in a relative peace and there was no excuse not to restart the Vargas works by June 1. Restarting Vargas: From June 1 2002 until December 1 2002. For obvious reason, the start of the strike certainly would stop any Vargas work. Still this gives SIX more months of normal paced public works. Not to mention that oil prices were climbing by then. 1: oil money was again pouring in, at higher prices, compensating any lack of oil production. By June 1, as to the own government admission international reserves were up and THERE WAS THE MONEY to work again in Vargas, even at a lower speed. 2: the government certainly was willing and able to work. Those were days then the misiones went full speed, demonstrating without any ambiguity that there was the money and the capacity to work for anything that the government set its mind on. Vargas 2: February 2005. Since work could have restarted as early as June 1 2003, and at full speed no later than January 1 2004, we can safely assume that 7 slow months of work could have been completed, with 13 more months of normal work following. 3.8 years is enough to clean up, do a real highway along the shore, control more than half the streams, build 5 000 subsidized housing, restore utilities. The rest could have been taken care by the private sector AS IT DID wherever it could considering the slow pace of the Vargas recovery share allocted to the state. But instead I will bet that part of the monies were allocated to the electoral effort of El Supremo, not to mention that the workers of Corpovargas had probably to go to marches or set up the campaign billboards instead of doing their job. Yes, Jesse, it does not matter what spin you put, Vargas IS the symbol of how little your side really cares about the people, besides buying their votes. ...not to mention assessing the mendacity of the Chavez administration. With the Vargas II disaster, relatives in the middle, and my return from a long trip, I have not been covering other items that I wanted to cover. For example the Danilo Anderson case which is turning out to be a case of rival extortion gangs in the prosecution offices of the state. Just today El Universal publishes that the sister of Danilo Anderson was to receive 80 millions Bs. (41 K USD) from her brother. Darn! I wish that one of my brothers would send me a gift for a quarter of that amount! But before I cover a few of these issues which the government is desperately trying to cover up, I prefer to do a press review on Vargas articles that came out this week. Well, there is already the article of Miguel that I previously mentioned. El Universal has a series of articles on Vargas. One covers the works that were incomplete or shoddily done. Another article serves as an introduction to a series of reports covering many aspects of the post 1999 pseudo-reconstruction. One article, adequately titled El Gran Fracaso (the great failure) carries an interesting item on something that could have been done rather cheaply but that was never done. Besides listing the monies that Vargas received IN ADDITION to its normal budget, it recalls the promise made by Chavez right after Vargas I to build housing for 5 000 families that lost everything, within TWO YEARS. Well, apparently only 500 were built (5 years later), and experts had said that around 16 000 were needed. 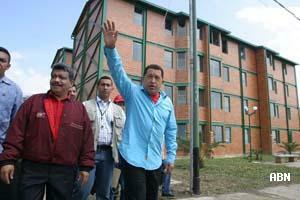 The funds existed, so how come these houses were not built, not even the ones promised by Chavez himself. Not to mention that subsidized middle class housing was built only to end up in the hands of certain public officials that had no business in Vargas, Danilo Anderson being one of them, curiously. 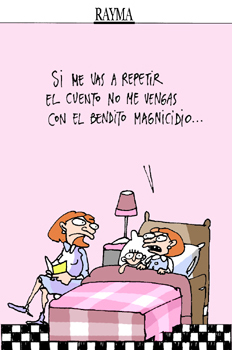 Tal Cual is not any kinder. In an article they actually take the trouble to write down the chronological list of some of the stuff promised, some of the monies collected, some of the warnings made by experts and more stuff. Since it is by subscription I have posted that article in my Documents on Venezuela section (sorry, no transaltions, too many to do, but at least you can forward these post to your favorite chavista and sit tight waiting for answer). I have also added a little text on the amounts of rain that fell these days, and more importantly how much rain needs to fall for how many days until mud slides begin. Vargas II seems not to bear comparison as to the potential damage of the rains as Vargas I. Yet, we all saw what we saw. Two strong op-ed pieces have graced our newspapers last week. The first one I will report is the one by Milagros Socorro, a long time favorite of this blog. In it she muses about the symbolical value of the new Vargas disaster. Comparison with more organized societies and chavista Venezuela are certainly not flattering for Venezuela. At the end of the article she coldly alludes to the social disaster that awaits us as the Chavez administration keeps mismanaging the country. To these we can add the informative listing of the short comings of Vargas administration also published as editorials on Wednesday and Thursday. From all of this emerges quite clearly the picture of a government more interested in building little Mercals (subsidized food distribution), giving little grants here and there to buy votes, than ensuring the durable welfare of its people. As we all know the two best social programs are stable jobs and a reasonably safe environment. The truth on the most mendacious of the populist governments that we ever had is finally emerging for all to see. Courtesy of recent events from Danilo Anderson to Vargas II . Miguel was inspired. He just gave us an excellent recapitulation of the main points in the Vargas story. From his report it should be crystal clear that the Vargas II episode of last week could have had much less negative effects than what it suffered had the government done the job it was commissioned to do by the National Assembly who provided ample funds to restart life on the state after Vargas I in 1999. Read Miguel article and then read the spin doctors in my precedent post. You may weep after. Now, the only question is: will someone pay for such an amount of inefficiency, incompetence, lies, corruption, arrogance and what not. With our judicial system I would not be surprised to see the whistle blowers go to jail. Why include Castro in a round up of news on the Venezuelan, and now Colombian, disasters? Wits would say because Fidel Castro is a disaster himself. But the reason is that Chavez used a Castro speech to promote himself while visiting a disaster idea, once again. But all in due time through the news recap for the day. Disaster in the Venezuelan Andes. If Vargas 2 was rather low in victims, this is not the case today in the Andes as tales of terror start coming from the area. Vargas was blissfully low in body count because in part people are scared by the rain and run for cover very fast, and because the normal holiday security support was in place and could shift into the evacuation mode fast. But the Venezuelan Andes are not so lucky, and the rains that were supposed to shift to the Oriental part of the country actually seem to have backtracked and made havoc in the high peaks and valleys. Merida state reports 300 dead or missing (only 8 confirmed dead so far). The swollen rivers coming from the Andes are feeding a Tocuyo dam which is reported near collapse (which happened in Miranda state in 1999 when El Guapo dam broke). 11 000 are to receive anytime soon an evacuation order. The Bucaramanga area is the area closer to Venezuela, and thus although in the dry season is also suffering of the rains hitting the Venezuelan Andes. But it seems to be happening right now and news are not fast coming. Still, 11 death are already reported, due to the same weather. It seems that the weather does not care about which side Granda was caught. The army acknowledges that the worse hit areas of Vargas have been Camuri and Naiguata (no word on Carayaca or Chichiriviche) Interestingly they showed videos that "supposedly" demonstrates that in some areas the Corpovargas Works had an effect. Which is a nice way, I suppose, to admit that in most places they were useless. Of course, this is the state trying to put some spin as a tsunami of criticism (even from some people loosely associated with the regime) is rising. I am taking bets right now as to whether some independent commission will be allowed to evaluate the achievements (?) of Corpovargas. Araira is a small village in the road between Caracas and the Eastern part of Miranda state, on the way to the beaches. It is a word from my child hood as regularly we drove by on our way to Higuerote and there was the only semi clean rest area, just half way to Higuerote, El Mirador. As a kid, seeing the sign "Araira" meant that within a couple of miles I would be getting out of the car for a few minutes. Well, Araira has been washed out as the river broke through main street and muddied the whole place. What is noteworthy in the story is that apparently (as heard on TV) a very old resident remembered having seen as a kid the river go through the village. We are a country without memory, already in 1999 some elderly remembered that Vargas had experienced the same type of weather and disaster in the past, once in the early 50ies and once in the 20ies, if I recall well the newspapers of early 2000. Yet, nobody seems to have wanted to inquire about these available pieces of information whether they were building expensive real estate in Los Corales or building shanties wherever they could in the risky areas of Vargas. So, perhaps considering that Araira was having damage interesting enough, or because it represents an interesting footnote in our history as an old Cacao center, Chavez went to look for the photo op in Araira. There he took the opportunity to say that all was fine, that all the government systems worked, etc.. He also blasted his ex-minister, Genatios, who created the initial plan for Vargas and who has criticized Corpovargas actions as improvised while his plan was the result of a deep study (1). Al this, no surprise, under the loving cameras and questions of the state TV, far from private reporters who could ask embarrassing cross questions. While in Araira Chavez also thanked Castro for warning him that George W. Bush wanted to kill him. Huh? It seems that during a 6 hours speech where Castro announced that Cuba was doing fine (? ), thank you very much (to Venezuelan oil, you old leech), he also declared that he knew that the US wanted to kill Chavez. Let's obviate the fact that indeed Washington would like very much to get rid of Chavez. Now, the first thing that should come to the analytical mind is that if Washington would really want Chavez dead it would have happened long ago. Let's also remember that the days where a US president could decree the death of a third world head of state are gone, or at least the risks are now too big in front of a US public opinion which is more inclined to accept an Iraq style invasion than the murder of some foreign crapulent potentate. So, what is the real point there? Two at the very least. 1-Create yet another smoke screen. That is, try to have people talk about nasty Bush and not about the incompetent Chavez administration and corruption as Vargas is now the poster scandal. This fits perfectly well with the theory of Chavez "disappearing act" during important crisis, a disappearance calculated to prepare the spin campaign. 2-And of course prepare the grounds for Chavez to seek a similar situation of murder paranoia and blockade (or what not) which has been the biggest help for Castro to remain in charge since 1959. Blame it all on the US, it pays off, and it surely exempts you from ANY self criticism. Not to mention that it allows you to throw to jail anyone that disagrees with you accusing that unfortunate soul of treason to the fatherland. Strong spirits of course laugh at such an infantile manipulation of the ignorant masses. After all, the informed observer could point out that more US presidents have been victims of real attacks than Castro; that Uribe in Colombia has had real bombs thrown at him while the Chavez assassination attempts have been shown to be risible montages for which we are waiting still for the first serious trial (arrest?) on that matter. But this time, Chavez should remember that "you can run but you cannot hide". Evidence of a corrupt and particularly inefficient regime are piling up, and high. The Vargas II disaster is to be added to the Danilo Anderson corruption/extortion murder, the end of independent justice, the sheltering of terrorists, just in the last three months. (1) Genatios is a scientist formed in France and who was part of the initial crop of ministers, in the days where Chavez was able to attract semi competent folks. At some point he resigned and left the administration. We seem to know why now: he was not a politician and he probably sensed the political corruption that was coming and probably did not want to have any part of it. All was fine until Monday night when the rain became quite heavy. On Tuesday morning most guests tried to leave but after a few hours most had to come back: the roads were already impassable. He had decided to go on Wednesday morning thus he was relieved that he did not waste the effort to leave on Tuesday morning. Tuesday night the resort still worked. But Wednesday morning the personnel could not come back and the limited night crew had to start improvising things. Resort guests started managing the kitchen and the food distribution as the lights went out, water went out, etc... Long lines were formed for the two single meals of pasta and arepa given to all. 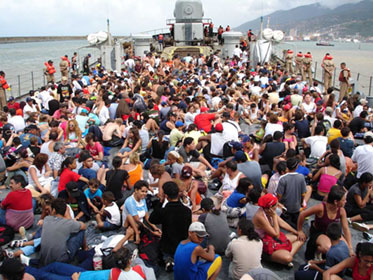 Through Wednesday a lot of people from Camuri and Naiguata village and beaches were sent to Playa Azul and Puerto Azul in prevision of an evacuation as Puerto Azul has the safe harbor of the area. Many arrived from Camuri through helicopter there, to fasten the evacuation instead of flying them to distant Maiquetia. Camuri was already a disaster area as the river had broken through the resort and wiped it out. Still Wednesday night the situation was in control, and just sending food and water there could have allowed people to remain longer while more critical areas were evacuated. But by Wednesday night things were getting worse and a first evacuation scheme was attempted and failed due to rough seas and constant heavy rain. 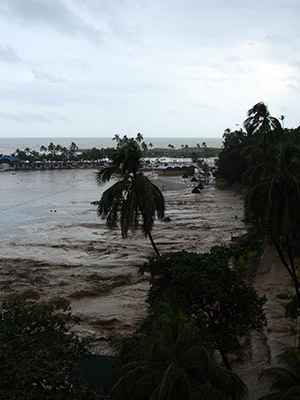 At some point early morning Thursday the river broke through Puerto Azul (in the pictures below). The first consequence of that, in addition of course to the thousands that were already refugees in Puerto Azul, was that people could not access the harbor anymore as it was cut from the resort by the river!!!!! 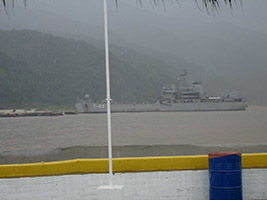 The torrent cutting through Puerto Azul, emptying in the harbour and cutting the escape way to the docks. Another view, this time with the green roof of the walkway to cross the gounds when it rains. The people are standing on the roof and if they were to fall in the torrent they would be carried all theway to the sea. Another fact aggravated the situation: apparently some of the guests did break in the kitchen at night and made out with the remaining food supply so that there was no more food left for Thursday morning breakfast! Talk about solidarity!!!! 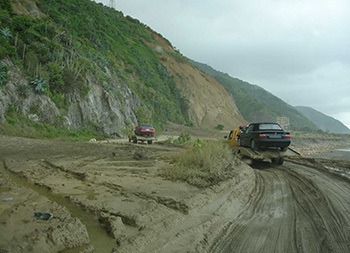 Evacuation was thus unavoidable, even more so that by now the only communication road was known to be washed out and could not be driven even if the rain were to stop. The evacuation was made through Playa Azul, with children, elderly, people, residents, tourists, all waddling through the knee high mud, and the rescuers only able to limit themselves to carry children and elderly. Next picture gives an idea on how far people had to walk, under the rain, through mud to get to the evacuation ship open close to the end of Playa Azul. Every one left behind all their belongings except a bag where they carried cameras, money, medicine and ID cards and blankets to cover themselves from the incessant rain. Garbage bags from the kitchens were used to protect children. All was left in the hotel rooms, or in the cars that had been parked in triple row in the most protected area of the parking lot (nobody knows if the river reached the parking lot, in the evacuation nobody could check out on that as all the grounds of Playa Azul and Puerto Azul were covered in a sticky layer of mud). Thus Puerto Azul, Playa Azul and the village of Naiguata are a prime target for the ransacking that characterized the incredible pillage scenes of Vargas 1. Filling up the boat took quite a while, as natives and tourists were piled up, even on the deck where it kept raining on them as if there were no tomorrow. My brother chose the upper deck as the covered area was foul with the smell of gas oil. Eventually they sailed, just to be welcome by Chavez making his crass little show and prolonging the ordeal by a few more minutes. I was told that many people were booing him but the state TV crew, now well trained, managed to hide that aspect of the disembarking, able to shoes enough pro Chavez folks in the landing refugees to provide the "human touch". It must have hurt a lot as most people were loudly blaming Chavez for the renewed collapse of Vargas, and justly so, at least for in some areas.